We want the Burns Community to know how thankful we are to be a part of you! 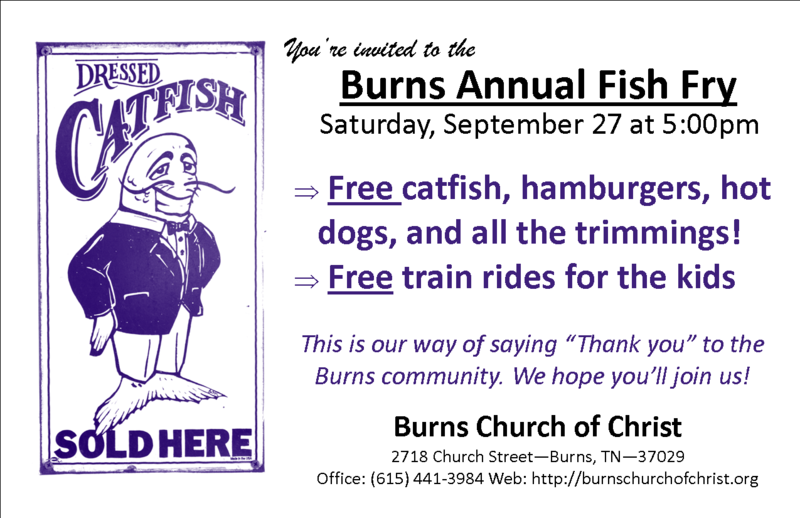 Our annual Fish Fry and Family day is scheduled for this coming Saturday, September 27, 2008. As usual, everything is completely free. We’re neither asking for or accepting donations! So come, bring your family at 5:00pm to our location at 2718 Church Street, and enjoy a fresh dinner of fried catfish and fixins, hamburgers, hot dogs, and the best desserts we can cook! Your kids will really enjoy our annual train ride in the parking lot…and it’s a great time for you to get to know your neighbors again. We hope you’ll join us!